Here in Arizona, Hackberry Emperor (Asterocampa celtis) butterflies are found in wooded areas in and near the mountains, especially those areas with Hackberries (Celtis spp. ), the food plants for their caterpillars. I spotted this Hackberry Emperor butterfly below in Agua Caliente Canyon, a brushy, riparian canyon in the rugged foothills of Arizona's Santa Rita Mountains. 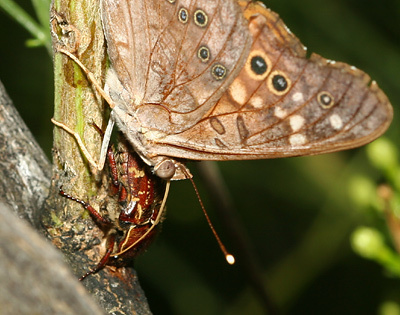 The Hackberry Emperor butterfly was climbing around on the back of a June Beetle or Scarab Beetle (Family Scarabaeidae). I thought at first that the Hackberry Emperor was trying to get overly friendly with the seemingly unperturbed beetle, but then I noticed that the butterfly's proboscis was gently probing all over the motionless beetle… Was the Hackberry Emperor trying to feed on the beetle instead? 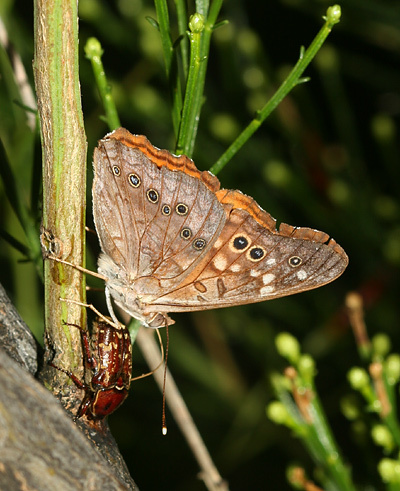 Adult Hackberry Emperor butterflies feed on sap, rotting fruit, carrion, or wet dung, so live beetles are really not on their menu. When I looked a little bit closer, it appeared that the beetle was feeding on plant sap, and the Hackberry Emperor soon discovered the beetle's sap source and began feeding there too. Hackberry Emperors have reddish brown dorsal wing surfaces, duller brown ventral wing surfaces, and a row of conspicuous eye-spots along the far edges of both the forewings and hindwings. Hackberry Emperors are variable in appearance and can look quite similar to Empress Leilia (Asterocampa leilia) butterflies, but Hackberry Emperors have two dark spots on the near leading edge of their forewings, while the Empress Leilias have a solid dark bar there.